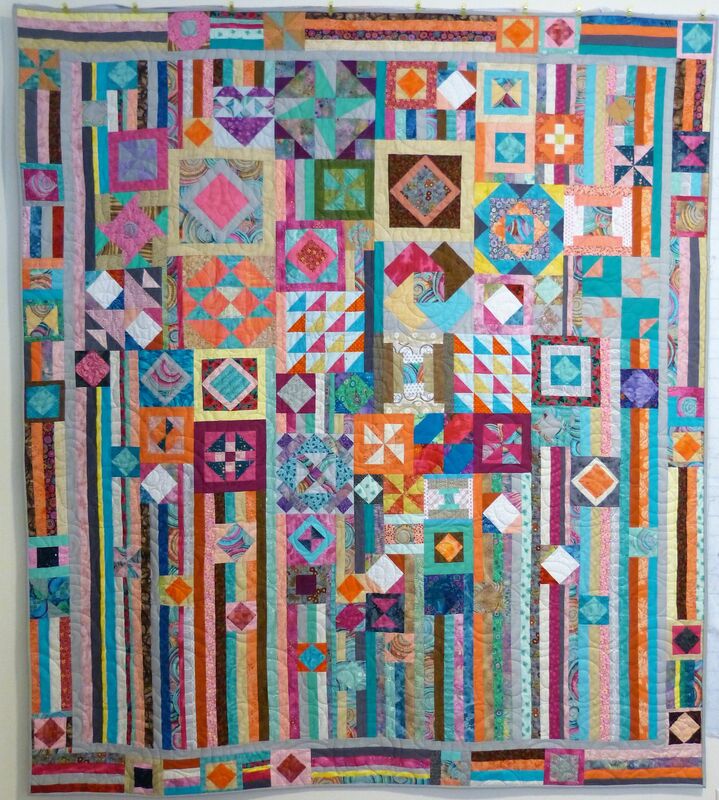 Our current raffle quilt is GYPSY WIFE designed by Jen Kingwell of Australia. The raffle quilt sewing committee was headed by Debbie L and Chris D.
The drawing will be held at the Quilt Connection meeting on August 30, 2018. Raffle tickets are $1.00 each, or 6 for $25.00. Contact a member you know to buy tickets, or access the email from the home page. Quilt retreats are generally twice a year, spring and fall. October 11 - 14, 2018. Our summer 2017 Quilt-a-thon will be Saturday, July 21 beginning at 10:00AM (doors open at 9:30). The project is a Twizzler table runner taught by Gail Mendiola. Cost for members is $2.00. Non-members are asked to pay $5.00. An additional $5.00 will be collected for lunch of pizza and soda. Everyone always has a good time. And we can't wait to see the beautiful completed quilt tops. have free time to browse the exhibit and the gift shop. We also have an option to buy a box lunch to be delivered to the museum, or brown bag our own lunch. The museum is wheelchair accessible. Next we will visit two quilt shops in the area: Ye Olds Schoolhouse, and My Material Matters Quilt Shop. Price for the bus trip is $57.00 which includes admission to the museum, and snacks on board the large, comfy, bus with "facilities". For more information, send an email from the home page!